I am including these photographs of tortoises in the wild to help assist with the construction of enclosures, to mimic wild conditions wherever possible. 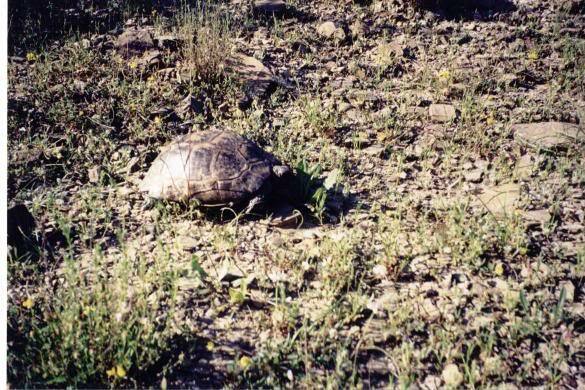 These particular photographs are of Testudo graeca ibera, taken in Turkey where I have spent time watching wild tortoises, both in sanctuary conditions and in their natural habitat. Habitats for other Mediterranean species and sub-species are very similar throughout Greece, Italy, Spain and southern France. This is typical tortoise 'country'. This photo was taken near to the base of a mountain in Antalya where several ibera tortoises were found to be going about their business as only a tortoise can. As you can see, even though the ground is incredibly stony, food supply is plentiful in spring and early summer. 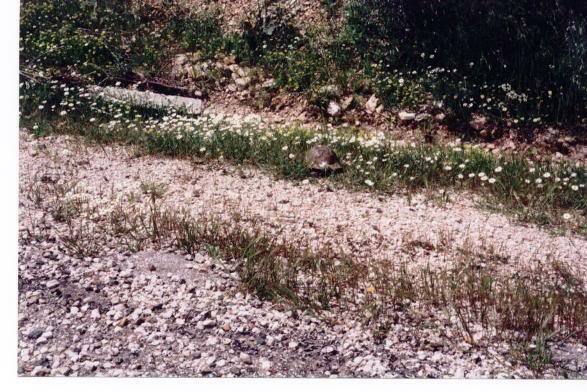 Just look at how well camouflaged the tortoise is. This is a typical Turkish road side. 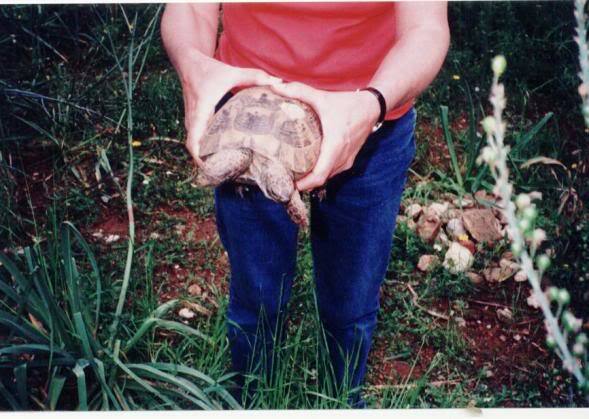 When looking for tortoises in the Mediterranean in it best to search well away from tourist areas. Unfortunately the only tortoises you are likely to see here are in street markets. These little ones will have been taken from the wild, with the intention of being sold to gullible tourists for a few euro's, a cheap pet by British standards but a decent amount of money for the locals, Please do not buy from these people however tempted you may be. For every one sold, many will have died and your purchase will only ensure more will be taken from the wild to replace them, with eventual devastating consequences to the wild population. Rest assured this practice IS illegal, no matter what the traders may say. Importing in luggage is likely to ensure a painful death for the tortoise due to low temps and pressure within the hold and if found with one of these little ones in your possession, customs now take a dim view of animal smuggling and heavy fines can be dealt. Imprisonment is a possibility for anyone willingly supplying others with animals this way. The best time to see them is early morning, when they are out foraging for food and after the harsh mid day sun has gone lower in the sky again. Hatchlings are rarely seen in the wild unless you know exactly where to look. Little tortoises dehydrate quickly so rarely stray from the shelter of vegetation and rock holes to avoid too much sunlight. 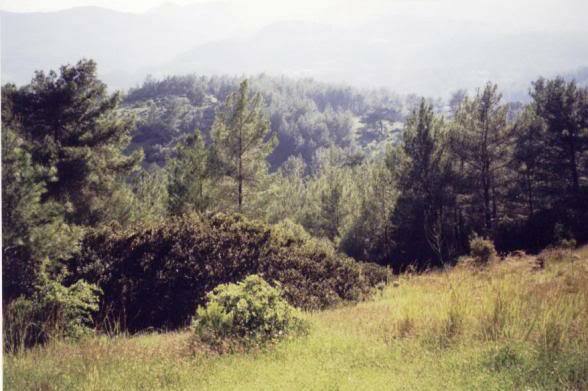 Sleeping under vegetation and rocks assists with hydration in the Mediterranean terrain. Occasionally a tortoise will be found in a wild situation that needs assistance. Tourists leave litter lying around that can endanger the lives of animals and all too frequently there are the inevitable road accidents. Many of these animals are left to die, just as many animals on UK roads are, but occasionally some have been helped by well meaning people living in the area. Fortunately Mediterranean countries are becoming more aware of how important it is to protect their natural species and surroundings and some will seek assistance for sick or injured animals. I had the good fortune to see some of this work first hand while staying in Southern Turkey. It is indeed heart-warming to see how some tortoises which would have died are now living normal lives again. This tortoise was found with a grossly swollen forelimb, having become tangled in fine wire/string. The leg has never returned to it's normal size but the tortoise is now no longer at risk of losing it following treatment at the sanctuary. Working in the sanctuary, assisting with marking of hatchlings to monitor growth etc It was interesting to see that there was hardly any difference in growth amongst tortoises of a certain year, something that would appear to be very different in captive reared tortoises. Along with two friends, I was lucky enough to spend several weeks in November 2010 on the Galapagos Islands, observing wildlife and flora at a very leisurely pace. During this time a lot was learned about the habitat and evolution of various animals of this remarkable archipelago of islands. Our base was situated within walking distance of the Charles Darwin Research Centre on Santa Cruz, where we spent many happy hours doing nothing but observe the local goings on of both humans and animals. For one week of our adventure we joined a cruise around the various islands, which allowed us to see species that habitated particular islands. The boat we joined was called The Samba and was an old sailing fishing boat, adapted in recent years to take small parties of around 12 people along with a local guide, to allow them the privelege of visiting this unique group of islands.